The Tao Te Ching is one of the formative books of the philosophy of Taoism. Written by Li Ehr (Lao Tsu) in the 6th century BC, this little book of 81 paragraphs provides a mysterious and poetic view of this naturalistic way of life. This paragraph can help us to gain greater skill in our Tai-chi forms and push hands practice. It suggests a way of “knowing” that is different than memorizing facts. This little book points us in the direction of a depth of awareness that lies beneath our normal way of perceiving and analyzing. In Norse mythology this same substrate of awareness is called “The Underworld” and the “Tree of Life” is what connects the deeper, surface and higher levels of awareness. When you begin to learn Tai-chi you have no choice but to use your programmed mind (thinking mind) to memorize movements and principles. You feel that if you can do all the movements in the proper order and write down all the principles, then you have learned Tai-chi. But there is still more to learn. The purpose of Tai-chi practice is to lead you to the deeper level of awareness and to understand the nature and dynamics of consciousness. The exercises are just a means to an end. Without full access to this deeper substrate of awareness you don’t have your full power in life. At a certain point in your practice you must be willing to “not know”, that is, to allow the intelligence of your body to take over the movements and let the “head” (thinking process) to just sit there and not get involved. At first the student feels that if he lets his head just “sit there” he will not be able to function. How can he exert his intention without thinking? There is a different type of intention possible that is organic. It is like dropping a pebble into a still lake. The ripples emanate from the initial action (of the pebble). Feel your belly area as the still lake and your tensions and thinking as the pebble. Drop the pebble into the lake and then do your Tai-chi form or push hands. At every moment your movements should come from dropping pebbles into the lake. This means that the grabbing, tense, unsatisfied mind ceases to “claw at the world” and just takes a break. This frees up a lot of energy for the natural mechanisms of the body to work. If we claw at the world our perceptions are limited to what we are grasping for. When we give up grasping, then we can really see what is going around us and inside of us. “Naming” in the paragraph of the Tao Te Ching refers to the tendency to making the world we perceive conform to the world we expect. I call this, “The Echo of Expectations”. (What you see of a reflection of what you expect to see). Your body activities, down to the cellular level, then conform to your expectations rather than to your perceptions. You are locked into what you “know” (the story you tell yourself about what is going on). Your world becomes small and your ability to react appropriately becomes limited. 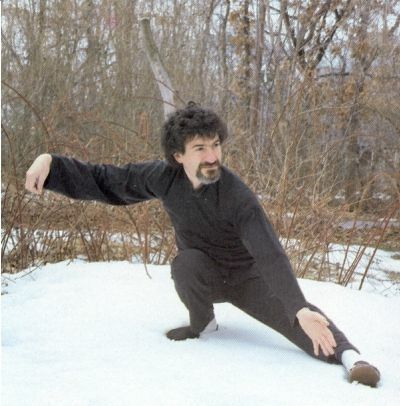 And so Tai-chi practice is a process of “not knowing”, i.e., being willing to not control every movement with the thinking process but to remain in the feeling mode, to participate in life and allow yourself to “not know” where that will take you. Your attention should be within the action, not in the head looking down at the action. And then you find that you are now outside of a cage you didn’t even know you were in, a cage of “knowing”, of “naming”. Tai-chi and Zookinesis training emphasize the ability to move every part of the body freely. Why is this important in everyday life? Most of the people who first come to Tai-chi classes cannot move very well. Their joints and muscles are so frozen that simple things like walking are an effort. They wear their bodies out quickly. The lungs don’t fill completely with air because they don’t fill the lungs from the bottom up. Their abdominal area is tight and the ribs have lost their flexibility so they only breathe into their upper chest. If you don’t breathe fully, your body doesn’t function efficiently and you lose energy quickly. Physical tightness also affects the emotions, making you more rigid as a person. The emotions reflect the physical state vice versa. If you are physically unsure of yourself, if your body feels it cannot function well, then you become emotionally unsure as well. By becoming fluid and skilled physically, this gives you emotional confidence as well. You feel more comfortable in your body and so you are more comfortable around other people. Going through life tight and rigid is like being in your self-made prison. You can release yourself from this prison by learning Tai-chi and Zookinesis Exercise. My students have gotten frustrated that I continue to correct their postures in the Tai-chi form. They feel their postures should be perfect by now. In the last class I explained that, while they know how to achieve perfect postures, there is an issue that is interfering with their form. I correct their postures to get them to achieve an “emotionless state”. This means ending the battle of the mind and emotions in which the natural, relaxed state of body feeling is disturbed by the worries and fears of the thinking mind. This battle then gets represented in the postures of the body. The body is expressing the battles of the mind and emotions. In the “emotionless state” you are still feeling things such as your connection to the world around you, your energy and enthusiasm, etc. But your body is not being used to express internal battles. When students try to remember the proper stance in a particular part of the form, they try to remember the feeling associated with that stance and duplicate the feeling, hoping that will make the body assume the proper shape. But they are also dragging along all sorts of other emotional expressions. It is difficult to remember the proper “stance feeling” cleanly without other emotional expressions hanging on. Instead, they need to “clean house” by freeing every joint and muscle of the body from emotional control and letting each part of the body “sit” comfortably and yet be fluid enough to move in any direction at every moment. It is a “suspended” state in which the body is open to anything – to any sort of response. It is that openness; that relaxed and suspended state that they need to use as a reference. They already know the right way to hold their bodies for a particular stance in the form. But they need to be free of conflict in that stance. This is something they can do by themselves. If they depend on me to correct their outer form all the time, they will be depending on me for the rest of their lives. Now that they know the form in and out, they need to know themselves in and out. They need to know when their inner emotional state is trying to take control of their body postures and instead let their postures be controlled by proper body mechanics (which they are also very familiar with by this time). In other words, it is time for them to correct themselves. The Tai-chi forms were developed to serve as a tool to teach you to end slavery to your inner conflict. Once you have learned the form, the real work begins. The teacher teaches you the tools but only the student can use those tools for his own progress. One of my students is an actor. If he has just finished one role and must now begin working on a completely different role, there must be a time in between where he sheds the first role before taking on the second role. At this time he has to be neutral – not one role or another role. He can clean himself out of the first role so that he can be open to something completely different. We try to remain in this “neutral state” throughout the form. The form is not a movement from one attitude to another but must be free of attitude throughout. In this way the body and mind are always open and ready for anything new. The mind does not cling to any frozen state or feeling. It is a state of non-attachment. During the last class, my students expressed their frustrations that they are not progressing as fast as they would like. When frustrations build to a head, the students are usually ready for a breakthrough. They are ready to let go of the conflict of mind and emotions. Their frustration is an expression of the last gasp of that conflict. WHAT IF THE WORLD WERE FLUID? One of the most important lessons I have learned from my training is that the condition of your mind and emotions greatly affect how you perceive your physical environment. Your senses don’t simply tell you what’s “out there”. The senses are in a fluid relationship with what is going on inside of you. My wife Jean used to teach a class in the “foam roller”, a four foot long, eight inch thick piece of sturdy foam. At the beginning of the class you lie on the floor and notice how your back feels on the floor. Of course, the floor feels very hard. After rolling on your back on the foam in various ways, you lie on the floor again and the floor feels as soft as a soft mattress. How you feel the floor depends to a large degree on the condition of your back – tense or relaxed. After a push hands class, students feel very different than before. Push Hands requires you to relax and to be connected to your partner. Your attention must fill his body so that you know what is going on inside of him. In this way you will know if he is preparing to push you. Your attention must be “released” into the partner as well as into the ground, so that you are “grounded” or “rooted”. If you are rooted you are much harder to push over. After class your state of connected attention is still with you. As you move in your surroundings, you seem much more connected to them, less isolated and more aware of what is going on around you. The world around you seems much more vivid. It seems to be part of your flesh and much more alive. Now imaging feeling this way all the time. You would have to live in a “softer” (more natural) environment to be able to exist constantly in this state. Otherwise the “harsh” world would wear you down quickly. And that is why we tense up and withdraw our energy from the environment. Our modern environment is not “biologically friendly”. It is friendly to machines. And so we must become like a machine and become dead to the relationship between our inner state and our perceptions. Our state becomes frozen so that we can feel comfortable in a frozen environment. This stress reduction breathing exercise is part of the Zookinesis system of chi-gung. Sit in a comfortable chair and place your hands on a table in front of you about at the level of your lower ribs. As you breathe in, first concentrate on your belly, filling it with breath. As you continue to breathe in, concentrate on your hands and then the space a few feet in front of your hands. This is all done in one breath. As you concentrate on the space in front of your hands, slightly lift your head. If at this point (or any other point) you feel uncomfortable, stop doing this exercise. (Contact us to help you – info@movementsofmagic.com). Once you feel comfortable with this exercise, go on to the next step. Begin as above but after concentrating in front of your hands, lift your elbows slightly, (about a half to one inch, while still keeping your hands on the table), and concentrate on the space on the sides of your body, while you relax your back into the back of the chair. Your breath will, of course, now need to be slower. (You will need a chair with a comfortable full back). After breathing in, just breathe out and relax into the chair. Take a regular breath and then repeat this special breath. Repeat this exercise from one to six times at one session (at your discretion). Again, if this is uncomfortable, contact us. Our beginners group classes (half Zookinesis Chi-gung and half Tai-chi Yang Short Form) will be Mondays and Thursdays at 7-8pm. The Zookinesis loosens up all the muscles and joints, restoring flexibility, range of motion and muscle strength. The Yang Short Form allows your body to flow gracefully and smoothly, and teaches you to let go of tension and stress; Both improve breathing and concentration and increase the flow of chi (natural, internal energy). If you would like additional classes or classes at other times, please let us know. Call 631 744-5999 or email info@movementsofmagic.com We continue to provide private classes and Tai-chi massage at any time convenient for you.